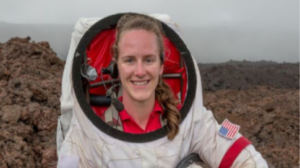 For a year, whenever she wanted to go outside, Whitefish-native Carmel Johnston would put on her airtight suit and then step out into a volcanic landscape, where she would begin to explore the network of lava tubes. It was all part of NASA’s Hawaii Space Exploration Analog and Simulation Mission (HI-SEAS). Carmel was commander of a 6-person crew that spent the year living inside a 1,200-sq-ft dome stuck on the side of a volcano in the middle of the Big Island of Hawaii.